↑ Hublin, J. J. (2009). "The origin of Neandertals". Proceedings of the National Academy of Sciences. 106 (38): 16022–7. Bibcode:2009PNAS..10616022H. doi:10.1073/pnas.0904119106. JSTOR 40485013. PMC 2752594. PMID 19805257. ↑ "Homo neanderthalensis - The Neanderthals". Australian Museum. 2013-02-25. สืบค้นเมื่อ 2014-10-03. ↑ 3.0 3.1 3.2 3.3 Dawkins (2005). M1 "Archaic homo sapiens" Check |chapterurl= value (help). The Ancestor's Tale (US Paperback). Boston: Mariner. ISBN 0-618-61916-X. ↑ Barker, Graeme (1999-01-01). "Companion Encyclopedia of Archaeology". Routledge – โดยทาง Google Books. ↑ Mitchell, Alanna (2012-01-30). "DNA Turning Human Story Into a Tell-All". NYTimes. สืบค้นเมื่อ 2012-01-31. ↑ "Neanderthals did not interbreed with humans, scientists find". ↑ Association, Press (2013-02-04). "Neanderthals 'unlikely to have interbred with human ancestors'" – โดยทาง The Guardian. ↑ Lowery, Robert K.; Uribe, Gabriel; Jimenez, Eric B.; Weiss, Mark A.; Herrera, Kristian J.; Regueiro, Maria; Herrera, Rene J. (2013-11-01). "Neanderthal and Denisova genetic affinities with contemporary humans: Introgression versus common ancestral polymorphisms". Gene. 530 (1): 83–94. doi:10.1016/j.gene.2013.06.005 – โดยทาง ScienceDirect. ↑ Amos, Jonathan (2012-03-14). 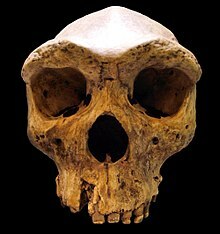 "Human fossils hint at new species". BBC. สืบค้นเมื่อ 2012-03-14. ↑ Barras, Colin (2012-03-14). "Chinese human fossils unlike any known species". New Scientist. สืบค้นเมื่อ 2012-03-15. ↑ Owen, James (2012-03-14). "Cave Fossil Find: New Human Species or "Nothing Extraordinary"?". National Geographic News. ↑ "Oldest Fossils of Homo Sapiens Found in Morocco, Altering History of Our Species". เดอะนิวยอร์กไทมส์. 2017-06-07. ↑ "Oldest Homo sapiens fossils discovered in Morocco". Washington Post. 2017-06-07. ↑ "World's oldest Homo sapiens fossils found in Morocco". Science Magazine. 2017-06-07. ↑ "Oldest Homo sapiens fossil claim rewrites our species' history". Nature. 2017-06-07. ↑ Huyssteen, Van; Huyssteen, Wentzel Van (2006-04-12). "Alone in the World?". Wm. B. Eerdmans Publishing – โดยทาง Google Books. ↑ "Cro Magnon skull shows that our brains have shrunk". Human Timeline (Interactive) - Smithsonian, National Museum of Natural History (August 2016). หน้านี้แก้ไขล่าสุดเมื่อวันที่ 12 กรกฎาคม 2560 เวลา 13:55 น.